Fall color is reaching its peak here on Cape Cod and the weather has been great. Some recent guests at our historic bed and breakfast raved about their bike excursion on Martha’s Vineyard. I have written a few blogs about our favorite bike paths on Cape Cod, but my guest’s enthusiasm reminds me that the travel industry advertises us as the ‘Cape and Islands’. So to be fair and balanced, I need to also cover biking on the islands of Nantucket and Martha’s Vineyard. I also should not digress too much into the discussion that, in fact, Cape Cod is also an island since it was separated from the main land by the building of the Cape Cod Canal in the late 1800s. Many of our guests want to see one or both of our famous sister islands. Jan has blogged about the ease of day tripping to them in previous blogs and the many sites to see, so I’ll just focus on the biking opportunities. From our Inn in Sandwich, the docks for the ships to these islands are about 20 miles away. To Nantucket you sail from Hyannis and to Martha’s Vineyard you sail from Woods Hole. The Massachusetts’ Steamship Authority which charges a small additional fee for taking your own bikes with, services both islands: Nantucket is $7.00 and Martha’s Vineyard is $4.00. 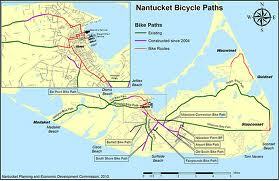 Of the two islands, Nantucket is the smallest and the most biking friendly. The main part of the island is only about 10 miles long by about 3 miles wide and has an extensive network of paved bike paths that allows you to see up close the natural beauty. The well-marked trails lead from Nantucket Village to beaches on all sides of the Island. In the village you need to watch the cobblestones, they are historic but very hard to ride on. The trials are of varying length from 3 to 4 miles one-way to over 10 miles one-way. All are mostly flat with great scenery along the way and upon arrival you are at beautiful beaches on either the Atlantic Ocean or the Nantucket Sound. If you need to rent bikes, I recommend Young’s Bike Shop right on the wharf where the ship docks. This year while we were there, Jan got a Nantucket Bike Basket Co. woven basket for her bike complete with the official brass nameplate from Young’s store. It is a great source for all the info you will need to enjoy a great day of biking on Nantucket Island. Young’s is a landmark open since 1931 and worth a visit even if you don’t need to rent bikes. I am sure they will have something you need or will want for your ride. Martha’s Vineyard is another must see for our guests. It is almost three times larger than Nantucket, being about 22 miles long and over 10 miles wide, but is closer to the Cape. It is only about a 30 minute boat ride verses the hour on the fast ferry to Nantucket or two hours on the slow ferry, officially they call it the Traditional ferry but believe me it is a slow ride. So a plus is you get there quicker and it is great place to bike, especially if you are a more ambitious rider. Again, you take the Steamship Authority to either Vineyard Haven or Oak Bluffs. The Vineyard has seven separate villages including the two ports. Paved bike paths run parallel to most of the major roads, but it can be a long hall from one village to the next. Our favorite place is Edgartown and before we started inn keeping we annually stayed at B&Bs in Edgartown. I was younger then, but in fact may not have been in as good of shape, but I found out how far it is form Edgartown to Oak Bluff the hard way. We rented bikes in Edgartown and rode the six plus miles to Oak Bluff along the breath taking Beach Road which is the famous beach from at least two of the JAWS movies. I could not make the return ride and happily learned that all the public buses on the Vineyard are equipped with bike racks for wimps like me. The very efficient bus system is a most convenient way to cover the whole Island, jumping off with your bike to ride to a specific beach or village, then back on the bus for the longer trip back to the boat. Also, a short ferry ride takes you from the Edgartown dock to Chappaquiddick where you can ride to Wasque Beach on the Atlantic Ocean and visit the unique and beautiful Japanese gardens in the Mytoi preserve. 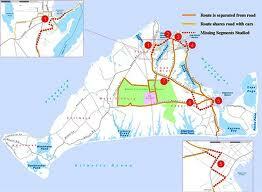 Martha’s Vineyards Information has good information about the bike paths and rental options. The fall season is here, the crowds are gone, and the biking is still great on the Cape and Islands. Come stay with us at our Cape Cod bed and breakfast and we’ll help you get to Nantucket or Martha’s Vineyard for a very memorable experience.